If you’re thinking of upgrading your living room with a Bauhaus classic, like a Marcel Breuer Cesca chair, or setting decorative accents with a Wagenfeld lamp, you’ll have to reach deep into your pockets to pay for one of these prized designer objects these days. Given the mantra followed by Bauhaus designers, who designed furniture with less well-heeled in mind, the prices their work fetches today seem paradoxical. And the prevailing opinion of Bauhaus pieces has done an about-face in keeping with their market value. Nowadays, their simple elegance is more trendy than revolutionary. Yet back in 1919, the Bauhaus was established with a radical agenda to create a new creative framework that could completely modernise everyday life. The Bauhaus art school was founded in a society suffering the devastating effects of the First World Word and the industrialized economy. Inflation, hunger, unemployment, homelessness and social unrest fuelled the desire for a new social order. In this environment of political and social unrest, a group of artists came together around architect Walter Gropius, who would go on to found the Bauhaus art school in Weimar. Gropius felt direction from a creative designer was the solution to the dire social straights his country was mired in. "Building is the design of life processes," he said about architecture, and some critics accused him of succumbing to a romantic utopia. Unlike the British Arts and Crafts movement, which idealized the Middle Ages and reclaimed Gothic shapes, the Bauhaus focused on a new approach to design. Interdisciplinary groups of artists would work, initially with craftsmen in Wiener, then later with industrial machines in Dessau, to create objects that would then shape the culture of the future. In the Bauhaus Manifesto, Gropius wrote: "The ultimate aim of all visual arts is the complete building! […]Architects, sculptors, painters, we all must return to the crafts! […]The artist is an exalted craftsman." Art? Not at the Bauhaus! Bauhaus proponents strictly adhered to its principles. Artistic aesthetics went against the ideology, so design took its cues from purpose and function, rather than style. This functionalist approach set the stage for inevitable conflict with those Bauhaus professors – known as “masters” in the Bauhaus jargon – who came to Weimer and Dessau as visual artists. This austere and innovative design language was particularly apparent in everyday objects. In the coffee and tea sets produced in the metal workshop, it is obvious that the individual elements did not have to fit together to satisfy the artistic standard. The cream pitcher, sugar bowl and pot are all quite different in style, and sometimes don’t look like they belong together, as their role determined their design and not the desire to create a set in the traditional sense. This tea infuser by Marianne Brandt is just one of example of how the movement turned its back on the applied arts. 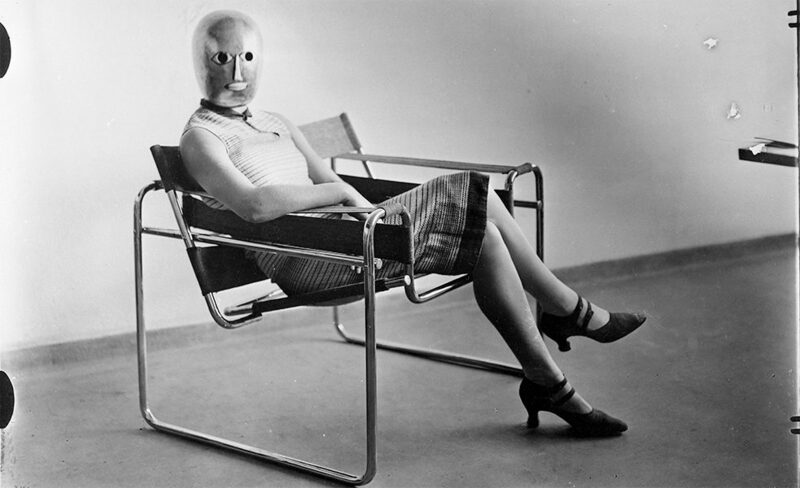 The “form follows function” motto was not new to the Bauhaus, but is inextricable linked to the Bauhaus style today. 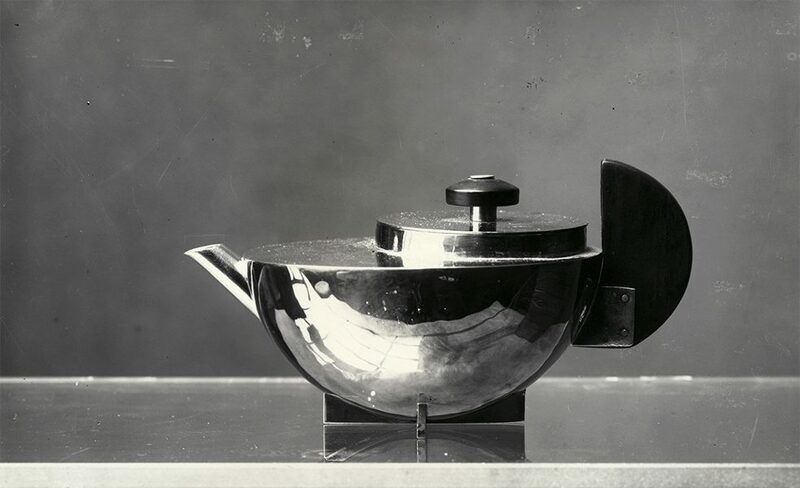 Tea infuser MT 49 by Marianne Brandt, photographed by Bauhaus photographer Lucia Moholy in Dessau in 1924. | Photo (detail): © picture alliance/dpa The new, modern approach was also visible in the textiles and fabrics that emerged from the Bauhaus. The textile workshop wove rugs with abstract shapes, very different from the narrative tapestries so popular at the beginning of the century. Otherwise it focused on everyday objects, like table cloths, runners, children’s clothes and test strips for industry. These were primarily crafted by female Bauhaus students under the tutelage of Master Gunta Stölzl, once a student herself. 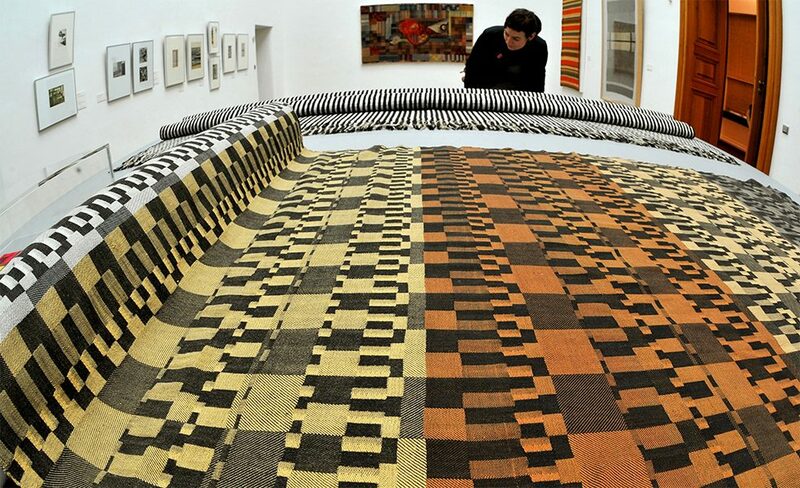 A rug by Bauhaus artist Agnes Roghé | Photo (detail): © picture alliance/dpa/Hendrik Schmidt But Bauhaus innovation went much further than just a design revolution. New occupational fields emerged at the unique interface between technology and design developed the Bauhaus workshops. 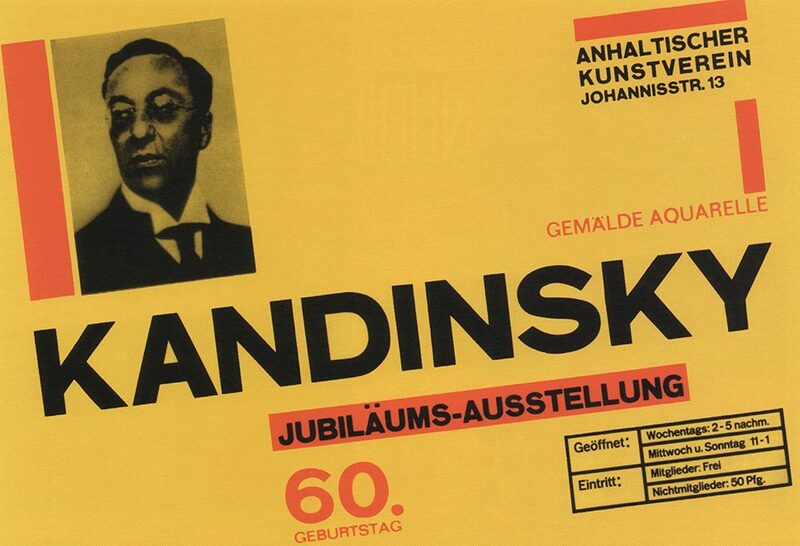 Marketing took a front seat too, and photographers were trained and modern typographies - mainly in red and black – designed to promote the pieces. The concept of a graphic designer was born in courses like the "systematics of advertising" and the "awareness effect" held in the advertising workshop. The revolutionary design developed at the Bauhaus under the leadership of Walter Gropius took a more social turn in 1927 under new director Hannes Meyer. Meyer argued that the Bauhaus must begin designing with a stronger focus on needs of the people - for the "proletariat". Under the new director's aegis, the motto shifted to "the people’s needs instead of the need for luxury!”; and the overriding question to be answered was: "What do people really need in their everyday lives?” Not more rugs, it seemed, so durable carpets were produced instead. The various workshops worked together to create materials with the tensile strength to withstand being stretched over a tubular steel chair frame. 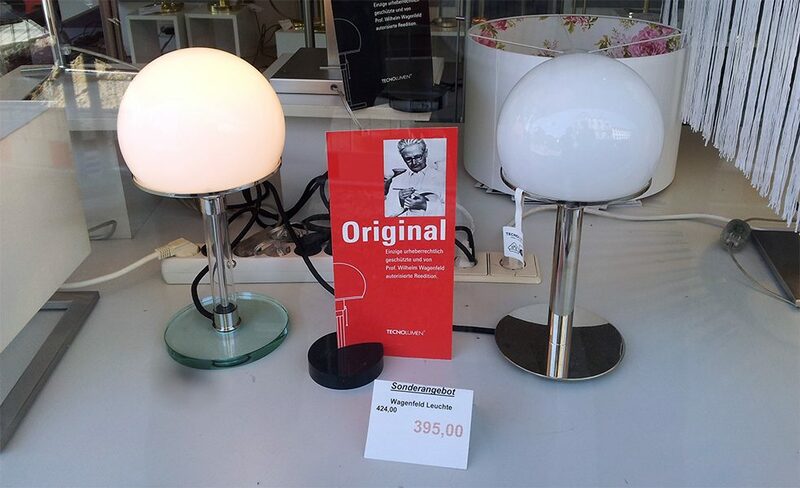 Today a popular and by no means inexpensive home-decoration piece: Wagenfeld lamps for sale. | Photo (detail): © Christos Vittoratos CC-BY-SA-3.0 And reality turned out quite different anyway: These days, Bauhaus design has gone full-on mainstream and the luxury objects are valued more for their aesthetics than for their function. But the Bauhaus principles and ideals have gone down in history. They continue to shape contemporary design and architecture and are still taught at art and design colleges worldwide. The legacy of Walter Gropius and his successors Hannes Meyer and Ludwig Mies van der Rohe is perhaps most clearly recognisable in many of our homes, as they were responsible for bringing progress, a modern lifestyle, and an understanding for clear forms into our living rooms today.